Last night I decided to brainstorm a few ideas , since Sale A Bration is ending and the new catalog will be coming out soon. We don’t know which sets will stay and which will go, but I found a new one that has really won me over in versatility, and an old tried and true to show off! The Hello, Sailor is sadly retired, but there are several other sea themed sets( and you know I own them all), that would substitute beautifully! The Hardwood Background stamp is so cool….use it as a fence, floor, deck….it’s really interchangeable. Also, just in the different types of wood it could be! The first card has a Mint Macaron base of 4 1/4″ by 11″ , scored at 5 1/2″ , so it is a vertical stand card. I used a piece of the Perfectly Artistic DSP, that is in the SAB catty. I used the greenish shade as I thought it went the best colorwise, and attached with Snail adhesive. It’s cut at 4″ by 5 1/4″. I added strips of Mint Macaron, 4 to be exact, measured at 1″ by 4 1/4″ and sponged the edges in Mint Macaron as well, placed on again with Snail. Then I used a piece of Watermelon Wonder 2 7/8″ by 4 7/8″ , sponged in the matching ink and a piece of Whisper White at 2 6/8″ by 4 6/8″. I stamped the leaves in Mint Macaron, and flower in Watermelon Wonder. These were attached with Snail as well. I used the 2 3/8″ Scallop Punch in Watermelon Wonder, and the 1 3/4″ Circle Punch in Whisper White. I popped each of those two up on dimensionals. Then, finally added a bow in the Whisper White Stitched Satin ribbon. Also, my new FAVORITE, Wink of Stella on the Mint sweep. Side note: I am not a glitter fan…..for me it never ends up where I want, so it’s usually all over me. HOWEVER…..I LOVE the Wink of Stella, I truly have added it to almost every new card I’ve made since it was delivered……and even re-embellished a few old cards too! For the second card, I used Tempting Turquoise as the base, again a vertical card. Second layer: Crumb Cake 4″ by 5 1/4″, I used the Hardwood Background stamp in Early Espresso and sponged the edges as well. Top Layer: 2 1/2″ by 4 2/8″ piece of Crumb Cake, stamped again with the Hardwood, but this time in Crumb Cake, sponged the edges as well. I cut a notch to make it a banner style layer. I used a piece of the Whisper White Stitched Satin Ribbon, and used my dauber to add Tempting Turquoise until I got the shade I liked. I also used a piece of Crumb Cake on the inside to keep the more masculine tone of the card. 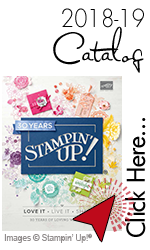 Again, sadly the Hello, Sailor set is RETIRED :(….but there are many other Nautical or Nature stamp set you could substitute in…..Sorry about that! Hope these hold you over until tomorrow….I have a really cute video to share with Y O U! !